Heart valve tissue engineering (HVTE) is a promising technique to overcome the limitations of currently available heart valve prostheses. However, before clinical use, still several challenges need to be overcome. The functionality of the developed replacements is determined by their biomechanical properties and, ultimately, by their collagen architecture. Unfortunately, current techniques are often not able to induce a physiological tissue remodeling, which compromises the long-term functionality. Therefore, a deeper understanding of the process of tissue remodeling is required to optimize the phenomena involved via improving the current HVTE approaches. Computational simulations can help in this process, being a valuable and versatile tool to predict and understand experimental results. 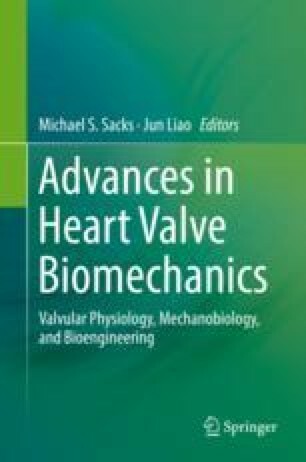 This chapter first describes the similarities and differences in functionality and biomechanical properties between native and tissue-engineered heart valves. Secondly, the current status of computational models for collagen remodeling is addressed and, finally, future directions and implications for HVTE are suggested. T. Ristori and A. J. van Kelle contributed equally to this work. Sauren AAHJ. The mechanical behaviour of the aortic valve. PhD Thesis Eindhoven: Technische Hogeschool Eindhoven. 1981. https://doi.org/10.6100/IR94978. van Donkelaar CC, Heck TAM, Wilson W, Foolen J, Ito K. Versatility of a collagen adaptation model that includes strain-dependent degeneration and cell traction. Vol. 1A: Abdominal aortic aneurysms; active and reactive soft matter; atherosclerosis; biofluid mechanics; education; biotransport phenomena; bone, joint and spine mechanics; brain injury; cardiac mechanics; cardiovascular devices, fluids and imaging, C. ASME; 2013. p. V01AT02A003. https://doi.org/10.1115/SBC2013-14214.